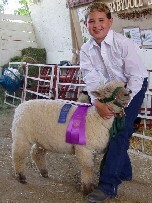 In a showmanship class a judge is looking for the showman who presents his or her lamb the best. Staying in control, bringing out your lamb's best qualities, and having knowledge of your sheep and the sheep industry is a must. The judges will ask some general questions to test your knowledge. 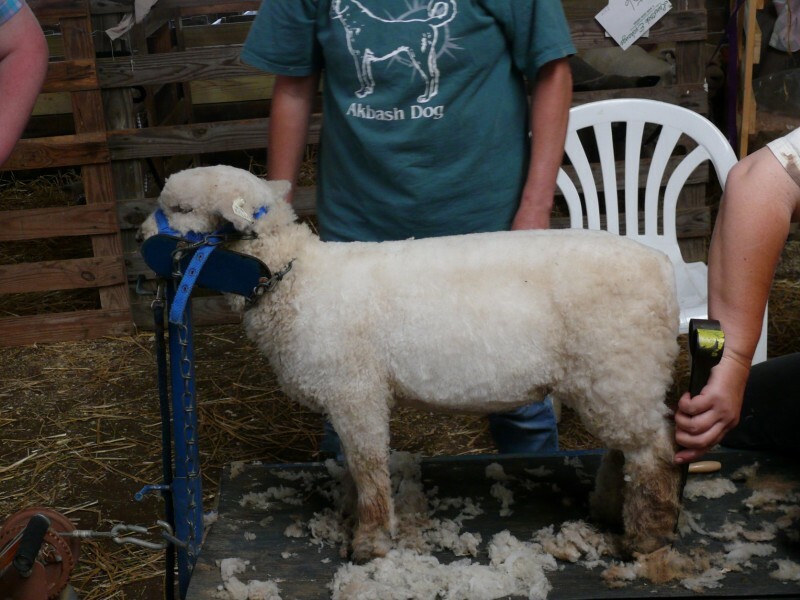 Assuming you have a clean, well-groomed sheep, the rest is up to you in the show ring. Unlike breed classes, you don't have to have the best sheep to win; you have to show it the best. There are two main showmanship styles in some areas; a modern style and a traditional style. The modern style is a slick-sheared sheep, shown from both sides of the sheep, and a showman who remains standing at all times with the sheep braced at all times. 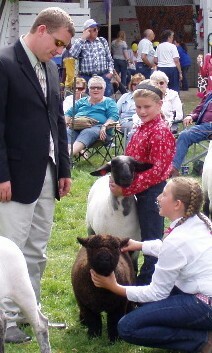 The traditional style is a sheep shown in fleece, shown from mostly the left side, and a showman who remains squatting unless moving or bracing the sheep. There are advantages to each; however, the traditional style of kneeling beside the sheep makes the sheep appear larger on the side profile and helps keep the top line level. Most judges will hold a meeting before the show and discuss what they like and dislike and will answer questions — be sure to attend. If you have the time, watch one of the classes before yours to also get a feel for what the judge likes. 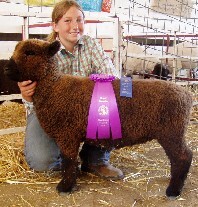 We find many judges have not seen BABYDOLLS or heard of them referred to as BABYDOLLS; in order to avoid confusion, be sure to include their complete breed name on entry forms — North American BABYDOLL Southdown or BABYDOLL Southdown. It may also be helpful to include a copy of the NABSSAR breed standard with photos for the judge to refer to. In the show ring, sheep are traditionally led on the left side and you should always keep your sheep between you and the judge. Entering begins one by one into the show ring moving clockwise until the whole group has entered. The judge may ask the group to stop and start or ask you to line up vertically or horizontally next to each other. This will go on until he starts to place the sheep in order of preference. This may take awhile and he will make his selections by watching, feeling your sheep and asking you individual questions. He may explain his judging either before or after the ribbons are awarded so remember, if the ribbons haven't been awarded, it may not be over. You usually show according to age group and the judges will expect more from a senior class than he will from a junior class. Be on time, be ready, and look nice for your class. Button down long sleeve shirts (white is less distracting), clean pressed jeans or slacks, leather belt, and clean leather boots along with your club-required attire is a good idea. Combed hair for boys and pulled back or braided hair for girls. In a showmanship class a halter should not be used unless you are younger in age. Since you are being judged on your handling, you should be leading your sheep with your hands. If you are showing two handed place your right hand behind the sheep's ears and your left hand under the sheep's jaw with both thumbs facing your stomach. When you are showing one handed your left hand is placed under the jaw, your right hand is behind your back or free. Choosing this option shows you have spent a lot of time with your sheep and have excellent control of them as well and the judge should notice this! Keep your eye on the judge. You don't want to miss any eye contact and be sure to smile. As you move around the ring, leave a little extra space between you and person next to you so you stand out. This will also be helpful with crowding. Remember it is your responsibility to be seen by the judge. When the judge asks the group to stop, quickly set up your lamb. Start with the rear legs, making sure all four feet are square under their body and even with the other legs, their weight should be distributed evenly over the legs. Place your hand under the chin (traditionally your left) and hold the head high. Practice setting up at home and have someone hold your lamb so you can step back and check if your lamb is square. However, if your lamb has excellent feet and leg confirmation, it is also very eye appealing to set your lambs rear legs slightly past square. This will draw attention to your lamb's best points, the muscling will be more pronounced, and your lamb will appear longer. If you find your lamb wants to sway its back, gently tickle their tummy with your free hand. The lamb will instinctively raise its back for a more level appearance. When traditionally squatting next to your sheep, avoid resting your knees on the ground. This will make your knees dirty and will take you longer to respond if you loose control of your sheep. The judge may also ask you to switch sheep, further testing your skills with someone else's sheep. If this happens, take at least one step forward with the new sheep to show you know how to set it up. If your sheep is being unruly keep your cool. A bad attitude or heavy handling won't win you any ribbons. If your sheep stops and doesn't want to lead, gently reaching back and lifting up on its dock will get it moving again. When the judge is viewing your sheep from the rear, you should be positioned in the front and ready to brace your sheep. Bracing is when you make your lamb flex its muscles for judging. 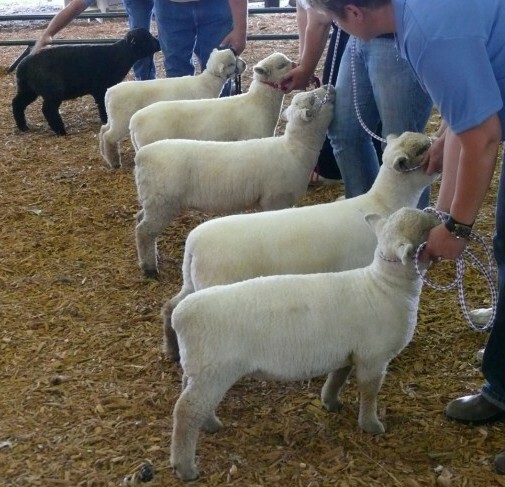 The judge will feel each sheep's muscling in the show ring. Depending on your height and that of your BABYDOLL, you will have to work with getting the knack for this. Ideally, the inside of your left knee is placed against the sheep's breastbone. Gently push back on the sheep, and encourage your sheep to push into you. Be sure to avoid pushing so hard their front feet lift off the ground as this is often frowned upon in the show ring. Your hands should be on each side of the jawbones and not the neck. After the judge touches your sheep, when he is not looking, quickly smooth the spots he touched with your hand with a fast smooth motion. Some keep grooming tools in their back pockets. Because they can be a hazard, keep them facing in or better yet, leave them out of the show ring. Practice your sheep knowledge in case the judge asks you any questions. If you don't know the answer, avoid saying "I don't know." Maybe mention you know where to find the answer instead. Examples of questions the judge may ask are, "How long is a ewe's gestation?" and "Can you point to the loin area?" Other common questions are the age and breed of your sheep and what it's best and worst qualities are. Again, refer to the breed standard pages on the NABSSAR website for help with this. Whenever being lined up side-to-side, keep your sheep parallel. Line your sheep's shoulder even with the first sheep in line. When lined up head to tail make sure your sheep is also straight behind the first sheep. Keep the lines straight and even and avoid crowding. As the judge narrow downs his selection, he may start to pull people out of line. If the judge calls the person in front of you out of line, promptly take their place unless you are now in the first position. After ribbons are awarded and the class is excused, congratulate fellow showmen and thank the judge. Regardless of the outcome, just remember the results are one judge's opinion on one particular day. A good showman will respect these decisions. Every show is different. The most important thing to remember is to HAVE FUN!